It can be messy and overwhelming to figure out how to solve thorny problems. Where do you start? How do you know where to look for information and evaluate its quality and bias? How can you feel confident that you are making a careful and thoroughly researched decision? Whether you are deciding between colleges, navigating a career decision, helping your aging parents find the right housing, or expanding your business, Problem Solved will show you how to use the powerful AREA Method to make complex personal and professional decisions with confidence and conviction. Einhorn’s AREA Method coaches you to make smarter, better decisions because it recognizes that research is a fundamental part of decision making and breaks down the process into a series of easy-to-follow steps; solves for problematic mental shortcuts such as bias, judgment, and assumptions; builds in strategic stops that help you chunk your learning, stay focused, and make your work work for you; and provides a flexible and repeatable process that acts as a feedback loop. provides a flexible and repeatable process that acts as a feedback loop. 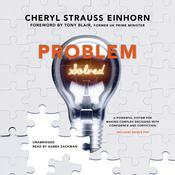 Cheryl Strauss Einhorn is an award-winning investigative journalist covering business, economic, and financial news for publications including Barron’s, Pro Publica, Foreign Policy, and the New York Times. She is the founder of CSE Partners, a strategic consulting practice that uses her AREA Method for businesses and individuals, and also teaches the method as an adjunct professor at Columbia University—first at the Graduate School of Journalism and now at the Columbia Business School.